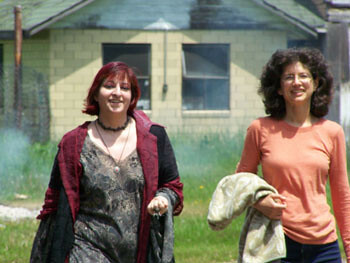 Leela Mata and Wendi Dee, pleased with the success of the retreat. 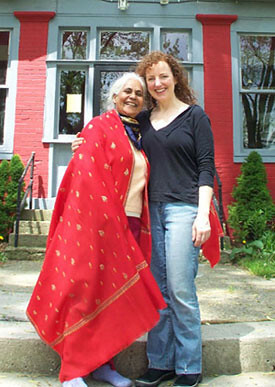 Leela Mata and I may have experienced the weekend from a different perspective than the guests, but we still enjoyed it just as much. 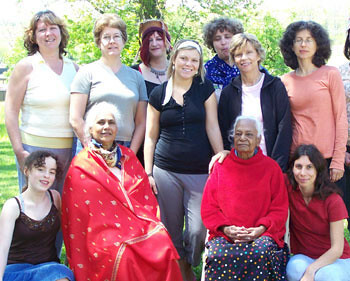 This was the first big event at the Peaceful Valley Ashram, and it was sold out! All available spaces were reserved, and we needed to decline a few requests that came during the final weeks prior to the event. Mata Ji was happy to have the ashram filled with the energy of so many guests. The entire place--the buildings and the surrounding property--sprang to life when the first guests arrived. I think at that point, Mata Ji was able to begin seeing the vision of her ashram coming true. It was my deepest pleasure to bring public awareness to the Peaceful Valley Ashram. The plans that Mata Ji has for the place come from a deep desire to help others find a peaceful space to fulfill their spiritual needs. KDcat enjoyed taking the compost out; it was a nice break from the kitchen. For me, I was happy to see my vision for the weekend finally coming to life. KDcat came along with me, to help me with the food preparations. I've told her, as well as just about everyone else: she was more than an assistant--she was my partner that weekend. She woke early in the morning to help me prepare the pre-breakfast fruit platters and fresh juices, created countless raw food meals, served the guests, cleaned up, emptied the compost multiple times, and did it all with a smile on her face and love in her heart! Not once did she complain, even though she was up, helping me, from early in the morning until after ten o'clock each night. There was no time for her to play or sketch, but she never complained. She was a pure joy and made the weekend even more lovely than I ever imagined. We started each morning with hugs and kisses, reminding each other that we were there to serve others with love, but we also wanted to have fun with the experience. We took many cuddle breaks each day, which helped both of us have the energy to continue preparing, serving, and cleaning up after each meal. 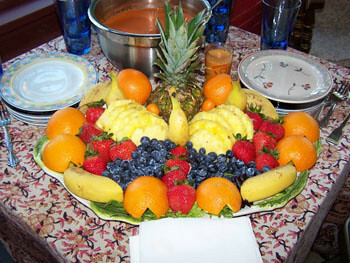 Whole fruit platter with fresh veggie juice. The food we served was beautiful! It was all 100% organic, fresh, and prepared with love. 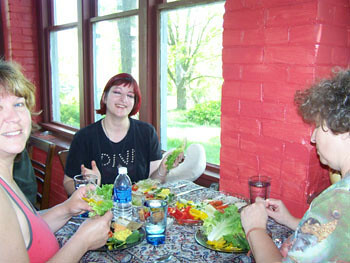 Many guests approached us, letting us know that they could feel our loving energy in the food! That made us feel great!!! We served four meals a day (pre-breakfast, breakfast, lunch, dinner) and made sure there were plenty of snacks available throughout the weekend, as well. I'm not sure which meal was the favorite for the guests, but I think it might have been a tie between the Mexican meal and the sandwich one. Many guests shared how thankful they were that I included recipes within the bound retreat materials for every dish served that weekend. Now they can create their favorite raw food meals at home! 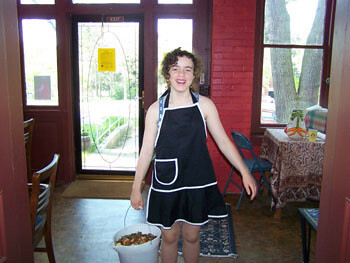 During the weekend, I also held food preparation demonstrations before each meal (three per day). I showed how to create some easy raw food meals, the ways pasta can be created, how to wilt kale to make it easier to consume, what the dehydrator is like, and so much more. I also held a raw food Question and Answer session and a small Raw Foods 101 talk. I enjoyed hearing the many questions and comments from those attending the retreat. I'm pretty sure KDcat enjoyed being asked some questions, as well, and giving her own answers. My favorite part of the weekend was the guests. Many of them either flew into Pittsburgh, or drove very long distances to attend the retreat. I knew I would love all of the guests, but they were even more wonderful than I imagined! I was able to get to know some of the guests a little before the retreat, through email conversations. However, meeting people in person always brings a deeper connection. My heart was overflowing with love for everyone I met. It was a weekend that I will never forget. I have continued to keep in touch with everyone, and I promised to have all of the retreat photos posted as soon as possible. I'm waiting to receive images that were taken with the ashram camera, too. It will be nice to have them all together, if possible. 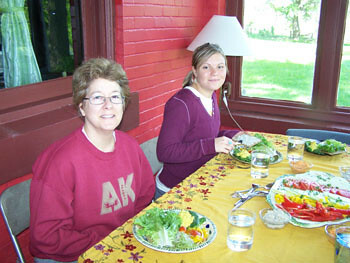 On the last day of the retreat, four of the guests remained for an extended retreat. I was able to talk more at that time, since the kitchen duties were cut back significantly now that there were only four guests to serve. I wished that I could have had more time with each person attending the retreat, since each one was unique and lovely in her, or his, own way. I said I would share my thoughts on the retreat, so I won't hold anything back. Here's the negative of it: it was exhausting! I was physically exhausted when I returned home. I took a few days to myself and did absolutely nothing at all. Waking up early in the morning, preparing, serving, and cleaning up after four separate meals (which were gourmet, multiple dish ones) all day long, and not finishing the kitchen work until around ten o'clock each evening for the entire weekend was completely exhausting. Our love of serving others, our joy of receiving lovely comments about all that we were doing, and the thrill of seeing many months of preparation finally coming to life is what kept us going that entire weekend. Once we returned home, however, it was time to crash! While we were working in the kitchen, some of the guests asked if they could help with something (it was obvious we were working very hard). As much as help would have been appreciated, I really wanted each individual to experience the peace that comes from a retreat. When you get away and life stills enough, you can truly connect with your inner self. Some guests helped by clearing their plates from the tables. But one guest (you know who you are, Angel!) wouldn't take no for an answer. She was often found washing dishes and keeping us company as we prepared the food, but also capturing pictures during the event. Part of me wishes she wouldn't have helped us, so that she could have experienced more solitary time, but then I wouldn't have gotten to know her so well! It was a pleasure spending time with her, as well as all of the other guests. I was approached by some of those attending the retreat and asked if I would consider organizing a yearly reunion for the 3-Day Raw Food Spiritual Ashram Retreat. I laughed a bit, and then said I thought it was a great idea, but only if we could hire someone to do all of the work and I could be one of the guests next time! I wasn't joking, either. I would love to be on the receiving end of a weekend like the one I created. There was a lot of attention to even the small details (finding out more about the guests before they arrived, notifying the ashram staff about individual needs, creating and giving gift baskets, developing a beautiful keepsake with the bound retreat materials, etc. ), making sure the weekend was as enjoyable as I could possible make it. It was a pleasure to treat the guests to such a weekend, and that was extremely rewarding. It was worth all of the physical exhaustion, because it filled my heart with joy and was very fulfilling on a spiritual level to be serving others in that way. Would I do it again? Maybe. I'd need to charge a lot more for the weekend, however, to hire some more help. It was far too much work for just two people. It was rewarding on so many levels, however, and I'm very happy that I put so much of my heart into creating that special weekend for the guests. It looks and sounds amazing! Thanks so much for posting the pics...I was really looking forward to them! 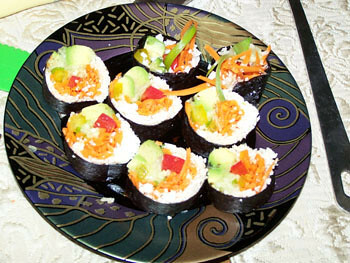 What is the white in the nori roll that looks like rice? Those look amazing, as does everything. KDcat is such a joy. I love that picture of her. Wendi....what a marvelous retreat! I have been so eager to know how everything went, so thank you for taking the time to give us the details. Raw Food preparations for groups is exhausting. When I used to sell my food at our local farmer's market, I worked myself into burnout. It took me months to get my passion for making food back. But I learned so very much, just as I know you did too. KDCat was such a blessing to have as your partner in the kitchen! She is a sweet little angel, just like her mommy! May I just say, as one of the fortunate people on the retreat, Wendi and KDCat have changed my life forever. Their sweetness, kindness and talents have touched my life and the lives of my family by being the blessings they are. It's true, I couldn't stay out of the kitchen, but that was because I saw how hard they both were working and while I wanted to help, the bigger truth was, I wanted to spend as much time with them as possible. The food they prepared was even more tasty because it was infused with so much love. Thank you girls, I love you both. Wow Wendi! You're a rock star for sure! Looks and sounds like it was a heavenly retreat for all those attending. The food looks fabulous. Glad to hear it was greatly appreciated and everyone felt the love put into each dish (everyone's genuinely smiling in each pic so that's gotta tell ya something). And KDcat is a blessing for sure. Not an easy thing to do being in charge of a retreat but no doubt she was rewarded in so many ways by the experience and friendships formed. Hopefully you're both fully recovered now. Thanks for sharing the experience. It looks absolutely fabulous. Job well done to you and KDcat!!!! The retreat was a blessing. This comes as no surprise though since both you and KD Cat are also blessings, so everything you touch can be nothing but a blessing. It is wonderful that we have managed to find each other again, this life; as I am quite sure we had been missing each other. Eating raw foods is not dangerous, especially if you are eating organically grown foods. I've heard about many people who have cured themselves of all kinds of illnesses, even though they were eating nonorganic raw food. 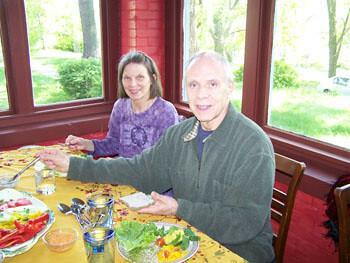 Please come back to look at my main site: www.PureJeevan.com to learn more about eating raw foods. Raw foods healed my body, healed my husband's body, and is healing people all over the planet! You can also visit http://www.AllRawDirectory.com for more information about raw foods.